This article presents a study of land‐use politics at the local level in Hobart, capital of the small island state of Tasmania. 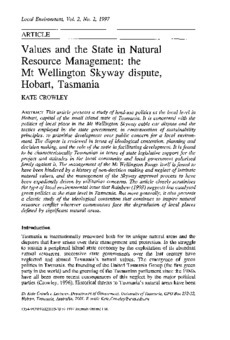 It is concerned with the politics of local place in the Mt Wellington Skyway cable car dispute and the tactics employed by the state government, in contravention of sustainability principles, to prioritise development over public concern for a local environment. The dispute is reviewed in terms of ideological contention, planning and decision making, and the role of the state in facilitating development. It is found to be characteristically Tasmanian in terms of state legislative support for the project and attitudes in the local community and local government polarised firmly against it. The management of the Mt Wellington Range itself is found to have been hindered by a history of non‐decision making and neglect of intrinsic natural values, and the management of the Skyway approval process to have been expediently driven by utilitarian concerns. The article closely scrutinises the type of local environmental issue that Rainbow (1993) suggests has catalysed green politics at the state level in Tasmania. But more generally, it also presents a classic study of the ideological contention that continues to inspire natural resource conflict wherever communities face the degradation of local places defined by significant natural areas.